The new online catalog allows you to keep a record of the items you have borrowed. If you already kept a reading history in the classic catalog, you can also import that list during your account setup. 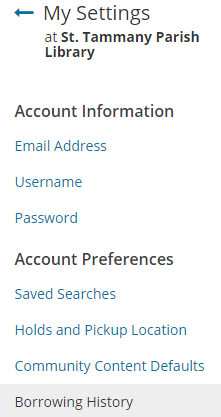 When you register for an account, you can import your reading history from the classic catalog on the Welcome to you New Catalog page by clicking Enable Borrowing History. You can also begin recording your borrowing history going forward in the My Settings menu that you access at the bottom of the dropdown in the upper right corner. Click on Borrowing History in the My Settings menu on the right. Toggle the switch to on and select Save Changes.